You know the problem: You’re trying to use your iPhone, but it’s almost out of power. From where you’re sitting the charging cable is barely able to reach the outlet, but because Apple built the dock on the bottom of your phone you have to hold it upside down. Meanwhile the app you want to use only supports the upright portrait rotation. 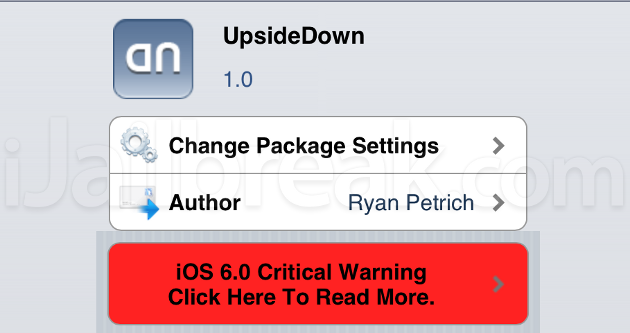 You could get used to reading upside down or you could install a tweak that will set things… upright. UpsideDown Cydia tweak running in April Fool’s Mode. UpsideDown is a Cydia tweak from Ryan Petrich that unlocks the upside down rotation for any app that allows a portrait mode. The tweak works as soon as you load it, and it seems to work with every app we’ve tweak aside from Cydia (which disables most–but not all–interface tweaks). On the iPhone or iPod Touch, this is great, but rotating the screen 180 degrees is old news on the iPad. Luckily UpsideDown is not just a utility tweak; it also comes with an “April Fool’s” toggle that can be enabled in Settings. April Fool’s mode will automatically flip launched portrait apps upside down, which is great for messing with friends. Just lend your friend your phone, the springboard will look normal, but when they launch the browser… you get the picture. Upsidedown is a FREE tweak and is available in the default BigBoss repository in Cydia. All you need to do is search for it and install. Would you use UpsideDown to improve your phone or mess with friends? Share your thoughts in the comments section below.